Coleman (ankle) is not listed on Friday's injury report for the matchup against the Storm, Pat Ralph of WNBA Insidr reports. Dealing with an ankle injury, Coleman has been sidelined since Sunday. But, she's apparently had enough time to recover. On the year, she's averaging 4.7 points, 2.5 rebounds and 1.2 assists in 19.1 minutes. Coleman (ankle) is sidelined for Wednesday's matchup against the Aces, Andrew Joe Potter of The Score reports. Coleman was ruled out for Tuesday's portion of the back-to-back set, and the 24 hours apparently wasn't enough time to recover. In her stead, Tina Charles and Kiah Stokes are candidates to see expanded roles. Coleman (ankle) is out for Tuesday's matchup against the Sparks, Andrew Joe Potter of The Score reports. Coleman was originally listed as probable for the contest, so it appears she may have aggravated the injury at some point, or it didn't feel as good as anticipated come gameday. With her out of the picture Tuesday, Tina Charles and Kiah Stokes will likely see expanded roles. Coleman (ankle) has been listed as probable for Tuesday's contest with the Sparks, Geoff Magliocchetti of Elite Sports NY reports. This is a good sign for Coleman, as it seems as though she'll play Tuesday. Coleman dealt with an ankle issue earlier this season, but this time it looks as though she will only miss one game. If she faces any setbacks and is unable to go Tuesday, her next opportunity would be Wednesday against the Aces. Coleman is dealing with an ankle injury and has been ruled out for Sunday's matchup with the Dream, Geoff Magliocchetti of Elite Sports NY reports. Coleman missed a stretch of games in early July with an ankle injury, so it's unclear if this is a related issue or if it's a new one entirely. Either way, the Liberty aren't going to risk any further damage and she'll be held out of Sunday's contest. With Epiphanny Prince (knee) and Shavonte Zellous (ankle) also out, Coleman's absence means there should be plenty of extra minutes to be handed out across the roster. In 18 games this season, Coleman has averaged 4.5 points, 2.5 rebounds and 1.2 assists across 18.8 minutes. Coleman (ankle) is not listed on the injury report ahead of Tuesday's game against the Wings, Geoff Magliocchetti of Elite Sports New York reports. While not on the injury report, it should be noted that Coleman is not listed as a member of the Liberty's starting lineup Tuesday. So, if the wing is fit to return to the court after a seven-game absence, she will be doing so off the bench and potentially in limited fashion. Coleman (ankle) will be sidelined for Sunday's contest against the Wings, Andrew Joe Potter of The Score reports. Coleman will be out for a seventh straight game Sunday, still recovering from an ankle injury. Her next chance to take the floor arrives Wednesday against the Sun. Coleman (ankle) is out for Thursday's matchup against the Mystics, Andrew Joe Potter of The Score reports. Coleman will be sidelined for a sixth straight tilt Thursday as she continues to recover from a sprained right ankle. That said, with her next chance to take the floor being Sunday against Dallas, Coleman may have enough time to recover in order to play. Look for more information as gameday draws nearer. Coleman (ankle) has been ruled out for Tuesday's matchup with the Storm, Andrew Joe Potter of The Score reports. Coleman will be missing a fifth straight contest and the fact that she's being ruled out a day in advance doesn't provide much optimism that a return is forthcoming. Following Tuesday's contest, the Liberty take on the Mystics this Thursday, which would only give Coleman another two full days off for rest. At this point, consider her questionable at best for that matchup as well. Coleman (ankle) will miss Sunday's game against Chicago, Andrew Joe Potter of the Score reports. It's been a week since Coleman sprained her right ankle, and her absence will stretch from three to four games when she's forced to stay on the bench once again Sunday. Her next chance to play will be Tuesday against Seattle, so her availability for that contest should be hinted at by her ability to participate in workouts and practice Monday between contests, as well as any work she's able to put in Sunday. Born: January 4, 1987 in Portland, Ore.
An nine-year WNBA veteran and the second overall pick in the 2009 WNBA Draft, Marissa Coleman has completed five seasons with the Indiana Fever…she spent her first five WNBA seasons with Washington and Los Angeles…Coleman is a versatile combo guard who can score, defend, push tempo and shoot the 3-pointer…she led Maryland to a national championship in 2006 and has bolstered the Indiana backcourt with size, strength and versatility…Coleman was a postseason hero in 2015, twice helping the Fever advance to the WNBA Finals with five 3-pointers in decisive Game 3 efforts at Chicago and New York…she has played at least 32 regular season games during each of the past eight seasons, and appeared in the playoffs in 7 of 9 WNBA seasons…Coleman surpassed the 2,000-point barrier for her career, during the same 2017 season in which she became the 11th player to accumulate 1,000 points in a Fever uniform…she is 55 rebounds shy of 1,000 in her career. 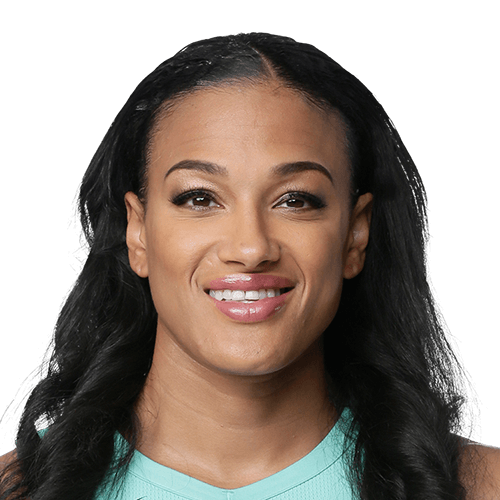 She participated in the Women’s March in Washington, D.C., in January 2017, and opened a Mellow Mushroom pizza restaurant in Roanoke, Va., with former LA Sparks teammate Alana Beard in November 2016. 2017: Coleman averaged 4.9 points per game and reached double-figure scoring four times…she scored 19 points with five 3-pointers in a home win over defending champion Los Angeles, 5/24…she scored a season-high 20 points with a career-high six 3-pointers against Washington, 8/20…she became the 11th player to score 1,000 career points in Fever uniform at Chicago, 6/28, and eclipsed the 2,000-point mark of her career at Connecticut, 7/30. 2016: Coleman averaged 8.3 points per game, twice scoring a season-high 19 points — vs. New York, 9/1, and Minnesota, 9/16…she struggled through a midseason slump, but scored in double figures in eight of the club’s last 11 games (11.4ppg)…she played in 32 games, starting 21…she averaged 3.3 rebounds and a career-high 2.0 assists per game…she scored a career-best 64 free throws in 2017, shooting 75.3 percent from the foul stripe, on a career-high 85 attempts…she matched a career-high with 8-of-8 FTs at San Antonio, 9/6. 2015: In her second year with the Fever, Coleman was the club’s only player to start all 34 games…she averaged a career-high 10.4 points per game, with 3.5 rebounds and 1.6 assists…she scored a career-high 25 points against San Antonio, 7/10, on 9-of-16 shooting with a pair of 3-pointers…she scored in double figures in 17 regular season games…her 42 steals also were a career-best, finishing 11th in the WNBA with 1.24 steals per game…she was elected to her first All-Star Game and shot 2-of-5 from long range for six points for the East squad, 7/25…she scored 16 points and dished a career-high seven assists at New York, 6/19. 2014: In her first year with Indiana, Coleman made 32 starts, in 34 games…she averaged a then-career-high 8.9 points, with 3.3 rebounds….she scored a season-high 20 points in a win at Washington, 6/6, that included a career-high 8-of-8 free throws…she had a season-high five steals at Seattle, 7/31. 2013: Coleman made three starts in 34 games with the Sparks, posting averages of 4.6 points and 2.9 rebounds in a star-studded lineup limiting her to 17.5 minutes per contest…she had a season-high 17 points at Tulsa, 8/2. 2012: Coleman played in all 34 games, starting in two for Los Angeles…she averaged 3.1 points, 2.6 rebounds and 1.1 assists per game…she had a season-high four assists and four steals at Atlanta, 6/15…she shot 90 percent from the foul line (18-of-20). 2011: Eighth in the WNBA in three-point field goal attempts (144) and 10th in the league in 3-point makes (53), Coleman started 28 games with Washington…she averaged 8.6 points and 4.8 rebounds per game…she scored a career high 21 points against Atlanta, 7/20, connecting on eight shots from the field, which was a career high…she posted her first double-double of the season against Tulsa, 6/26, contributing 13 points and grabbing a career-high 12 rebounds. 2010: Coleman appeared in all 34 games for Washington…she earned the first start of her career against the Connecticut Sun, 5/30, where she played 30 minutes, scored seven points, grabbed four rebounds, dished two assists, and had one steal…she posted her first career double-double against Tulsa, 8/1, scoring a season-high 14 points and tying a career-high with 10 rebounds…she ranked ninth in the league in 3-point field-goal percentage (.402). 2009: Coleman saw action in 28 games during her rookie year with the Mystics…she suffered an ankle injury which sidelined her for six games…she posted a season-high 16 points in the regular season opener against the Connecticut Sun, 6/6, including a season-high four 3-pointers…she averaged 18.8 minutes and 6.1 points per game. In seven playoff seasons, Coleman has appeared in 28 games with 17 starts…between her time with the Sparks and Fever, she has reached the playoffs in five consecutive seasons…she owns Indiana’s postseason record for single-game 3-pointers, twice hitting five 3FGs in decisive Game 3 performances at Chicago and New York in 2015…she averages 9.0 points, 2.5 rebounds one steal per playoff game…she reached the WNBA Finals for the first time in 2015 when Indiana faced Minnesota…in two playoff seasons with Indiana, she averages 10.8 points and 2.7 rebounds per game. 2016: Coleman had 13 points and two rebounds in a first-round loss to Phoenix. 2015: In the lengthiest playoff run of her career, Coleman averaged a career playoff high of 11.9 points while starting all 11 games and leading the Fever to the Finals…she reached double-figure scoring in 8 of 11 playoff games…Coleman tied the Fever postseason record with five 3-pointers in Game 3 of the East Semis at Chicago, 9/21, and again in Game 3 of the East Finals at New York, 9/29…she averaged 11.4 points through five games of the WNBA Finals against Minnesota. 2014: Coleman averaged career playoff highs of 8.2 points, 3.2 rebounds and 2.4 steals per game, in five playoff games with the Fever. 2013: Coleman appeared in three playoff games, totaling 10 points and four rebounds for the Sparks. 2012: In four games with L.A., she scored eight points with three rebounds. 2010: Coleman’s best playoff campaign including a 13.5-point average in two games of the East Semifinals against Atlanta. 2009: She averaged 10.5 points in two games of the East Semis against Indiana…one of her best playoff games was on her college home court at Maryland, where she tallied 16 points, eight rebounds, two steals and four blocks against the Fever. 2016-17: Coleman returned to Turkey for a third straight season, this time playing in Mersin…she averaged 15.1 points, 6.4 rebounds and 3.2 assists in an abbreviated schedule in the Turkish League…she averaged 14.6 points, 7.6 rebounds and 2.8 assists in EuroLeague action. 2015-16: Coleman helped Fenerbahce to a league championship in Turkey and a third-place finish in the EuroLeague Final Four…she averaged 10.9 points in Turkish League action, and 9.8 points in EuroLeague competition. 2014-15: With Edirne Spor in Turkey, Coleman averaged 16.7 points and 7.6 rebounds per game. 2013-14: Coleman helped the KB Stars, in South Korea, advance to the semifinals of the league tournament, averaging 6.0 points and 3.4 rebounds per game in 36 games. 2012-13: She signed in February with Cercle Jean Mace Bourges in France, appearing in 12 games while averaging 9.1 points and 5.3 rebounds per game. 2011-12: She split time between Perfumerias Avenida in Spain and Lyon in France…with Lyon, she averaged 10.5 points in eight games. 2010-11: She signed in January with Hungary’s MKB Euroleasing Sopron, playing in 10 Hungarian games and five EuroLeague contests. She averaged 11.0 points in EuroLeague and 10.6 points in the domestic league. 2009-10: Her first overseas venture was with Familia Schio in Italy where she averaged 5.4 points in 11 EuroLeague contests and 8.0 points in a dozen Italian games. A member of the gold-medal 2007 U.S. Pan American team, Coleman played in all five games of the tournament, averaging 9.4 points and 4.2 rebounds per game…she shot 57.7 percent from the field and 46.2 percent from 3-point range…she won a gold medal at the 2005 FIBA U19 World Championship in Tunis, Tunisia, in her second stint with the USA U19 Basketball team, averaging 8.8 points and 4.4 rebounds…the U19 squad was named USA Basketball 2005 Team of the Year…she also helped the USA win a gold medal at the International Sports Invitational in San Diego, Calif….she was a member of the 2004 USA U19 team that captured a gold medal at the Junior World Championship Qualifying tournament in Mayaguez, Puerto Rico, helping the United States to a berth into the 2005 FIBA World Championship. Coleman capped a decorated college career as the first player in ACC history to record over 2,000 points, 1,000 rebounds, 400 assists, 200 steals and 100 blocked shots…she finished her career as the school’s second leading scorer (2,205) and rebounder (1,139). 2008-09: A first-team All-American, Coleman was named the most valuable player of the ACC Tournament and an All-ACC first team selection while leading the Terrapins to their first ACC title since 1989…she averaged 18.1 points and 8.6 rebounds. 2007-08: Coleman earned AP honorable mention All-America honors for the second year in a row and second team All-American mention by Sports Illustrated…she became the fourth Terrapin ever to receive all-conference nods in each of her first three seasons…she was twice named the ACC Player of the Week, the second time following a career-high and Comcast Center-record six 3-pointers in the Terrapin Classic…she led the team in scoring nine times, reaching double digits 32 times, including 10 20-point games and two 30-point performances. 2006-07: As a sophomore, she was a second-team All-ACC pick a second year-in-a-row…she became the first Terrapin and the 11th player in ACC history to record a triple-double, tallying 15 points, 14 boards and 10 assists against UC Santa Barbara on Dec. 2, 2006…she was named the MVP of the Terrapin Classic… prior to the season, ESPN.com tabbed has as the No. 2 wing player in the country. 2005-06: Coleman earned billing as the ACC Rookie of the Year as Maryland captured the first NCAA title in program history…she led the ACC with a 47 percent 3-point shooting clip and tied the conference mark with 29 double-figure scoring games by a freshman…she was named second-team All-ACC…she had eight 20-point games including a 23-point showing in an overtime upset at No. 1-ranked North Carolina…she posted double-doubles in both games of the Final Four in Boston, grabbing 14 rebounds in each game…she scored 4 of Maryland’s 8 points in overtime, knocked down a pair of free throws in the final 13 seconds and grabbed the final rebound of the game to seal Maryland’s national championship victory over ACC rival Duke. Marissa Coleman was born Jan. 4, 1987 in Portland, Ore., and is the daughter of Joni and Tony Coleman…she has a sister, Tonya, and a brother, Anthony…a lifelong resident of the Washington, D.C. area, she played at the University of Maryland following a prep career in the District…she was drafted by the Mystics and played her first two pro seasons in Washington…in November 2016, she opened a Mellow Mushroom pizza restaurant in nearby Roanoka, Va., with her former L.A. Sparks teammate Alana Beard…her favorite athlete is Peyton Manning…she chose Maryland over Duke, Connecticut, Tennessee and Florida…at St. John’s College High School in the District of Columbia, she was a McDonald’s and WBCA All-American, playing in both senior all-star games…she led all scorers with 19 points in the McDonald’s game and was selected the East’s MVP in the WBCA game…she also was a first team Parade All-American…Coleman was named first team All-USA by USA Today and was the Washington Post High School Player of the Year…she earned first team All-Met honors in her final two seasons…she was the 2004 and 2005 Washington D.C. Gatorade Player of the Year, leading the Cadets to a 59-9 record in her final two years…she led her squad to the Washington Catholic Athletic Conference title game every year, capturing the title in 2002 and 2004…she left the school with career records for points (2,057) and rebounds (1,750)…she averaged 21 points, 10 rebounds, three assists and two steals a game as a senior. (1) Drafted by the Washington Mystics with the second pick, first round, in the 2009 WNBA Draft, 4/9/09. (2) Traded to Los Angeles, 2/1/12, in exchange for Noelle Quinn. (3) Signed as a free agent by Indiana, 3/29/14. (3) Signed a contract extension with Indiana, 9/14/16.